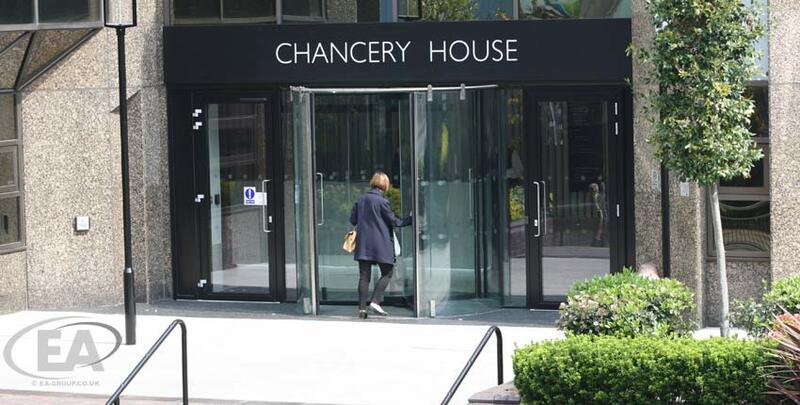 EA Group have just completed works at Chancery House in Sutton. The building originally had a manual revolving door with solid drum walls. Roll forward just a few weeks and they now enjoy a bespoke sized, frameless all glass revolving door that lets the sun light flood into the building reception. Features include integral night shutter doors to close across the door opening during out of hours, adding a further layer of security. Additionally, this manual revolving door is fitted with an underfloor power assisted drive to self park the door carousel after each use. All proudly manufactured in the UK and available from the EA Group with a short lead time. Are you looking for something similar? Please contact us or call on 01372 459536 for advice and estimating services.